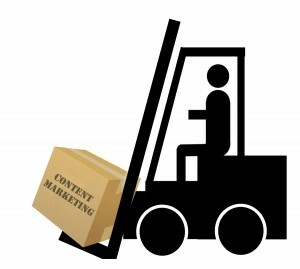 Is Content Marketing too Much Work? All relationships take work. Whether we want personal or business ties, we know we have to ‘put ourselves out there’ to meet other people. For business, content marketing could be the most popular way to build relationships by gaining subscribers and followers. But content marketing often confused with simply publishing. It’s easy to get caught up in the mechanics of making and posting updates, articles and videos without stepping back to see how they’re effective for you. If content marketing is supposed to build relationships, rather than sales, how can you tell it’s working? When do you know you are working too hard at content marketing for it to be worth it for you? Strategy starts with choosing what to measure, or Key Performance indicators (KPI’s). Having a strategy begins with knowing what behaviors you want to see improve, toward a stated goal. If you are wondering whether all the blogging and social media activity is worth it, ask yourself: how can you tell? If you are waiting for the phone to ring or site visits to go way up, you may be looking for the wrong signals. Decide what your goal is, what KPI’s are appropriate, and how to track them. There is no ‘one right tool’ to track your statistics — it is important to explore a few and see what works best for you. Buffer: Engagement statistics help you track engagement on Facebook, Twitter, Google+, and LinkedIn. For example, you can see Twitter retweets, mentions, clicks, and favorites. Facebook and Twitter each have their own analytics pages to help you track changes in follower numbers. The Overview is only relative to 7 or 28 days to the current date. But you can customize the start and end dates to measure other actions including: likes, reach, pageviews, actions and more. 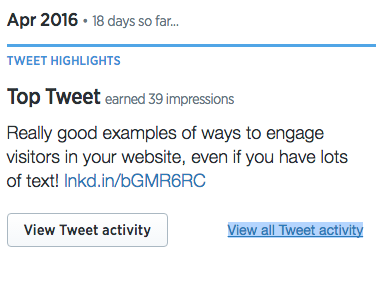 Analytics for each tweet are visible from your Twitter home page. But who wants to analyze one tweet at a time?! Aggregate data is available from analytics.twitter.com when you are logged into your Twitter account. To see results, you need more than activity. You need to know what change you’re trying to make. A strategy is more than an investment in good content — writing, podcasting, videos or graphics. First, it’s an investment in planning and choosing what to measure. Sometimes it’s easy to fault this expense, and say ‘content marketing is too much work’ if sales and telephone calls don’t go up. But unless you have a stated strategy, and can track performance relative to a goal, it’s easy to forget that content marketing isn’t really happening. To see the payoff, it’s important to keep the initial goal in mind, and know what to measure to see if the work is effective.